Emory Law celebrated its centennial year by honoring 100 alumni and faculty who have made extraordinary contributions to the law school and the world at large. This group of notable men and women, nominated by a Centennial Advisory Committee consisting of faculty, staff and alumni, represents the best of Emory Law’s story, both past and present. When you turn 100, you might be expected to look backward more than forward. 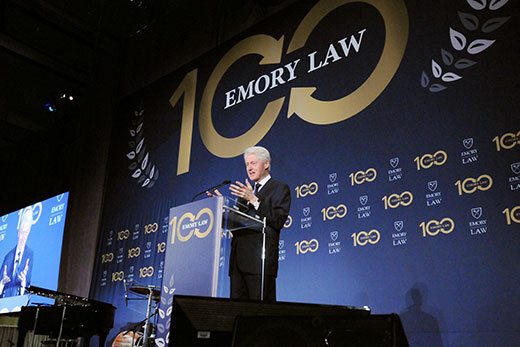 Not so for the Emory University School of Law on the occasion of its 100th anniversary, which was marked with a formal celebration April 29 featuring former U.S. President Bill Clinton and former U.S. senator and Emory Law alumnus Sam Nunn. The Emory Law Centennial Gala, which drew a crowd of 1,200 to a transformed Woodruff PE Center, was the culmination of a weekend of reunion and Centennial-themed events, and the final event in a series of nationwide events celebrating Emory Law’s founding in 1916. And while the event commemorated milestones in the law school's history, its focus was on the future, and the key role that both Emory Law and the rule of law more generally can play in solving disagreements and healing divisions. As the gala began Saturday night, the first person at the podium was a recently accepted student, Sean Ripoll Cruz 20L, who radiated enthusiasm for his new academic home. Though fresh on the scene, he already embraces Emory Law's tradition of excellence and competitive spirit. “If anyone wants to share any class notes, I am at table five," Cruz joked. Underlining the feeling of family and community that characterized the evening, Cruz had the honor of introducing his mother, an artist retired from the Metropolitan Opera, Aixa Cruz-Falu, who beautifully rendered the National Anthem. In his welcome remarks, Dean Robert Schapiro acknowledged his role as the weaver of the many narratives that constitute Emory Law. President Claire E. Sterk touched on several chapters of the school’s early history, including the work of Bishop Warren Aiken Candler, Emory’s chancellor at the time, to establish a vision for that first law class of 26 students. The president went on to talk about Eléonore Raoul’s crafty move, registering for Emory Law in 1917 when Candler was away, yet the rules barring women were still firmly in place. Raoul stayed and became the first woman to graduate from Emory University. “That tells you something about the creativity that comes with the rule of law," Sterk quipped. She detailed other key moments in the school’s history, including the contribution made by Henry Bowden 34L, chair of the Emory Board of Trustees at the time, and then-dean of the law school Ben Johnson 40L, who successfully argued the case that desegregated Georgia’s private colleges and universities. Three years after that suit was filed in 1962, Emory began to admit African Americans — first Ted Smith 65L, followed by Marvin Arrington 67L and Clarence Cooper 67L. The president also noted the more modern aspects of the school, detailing the degrees beyond the JD that graduates may earn — including the JM and LLM — as well as the points of intersection law has with professions such as the social sciences, humanities, public health and healthcare. Sterk also credited the work of the law clinics, which, she said, “fight for justice on the part of people who are so vulnerable, including women and children and our nation’s veterans.” And she remarked on the many joint degrees available to Emory Law students, including those with public health, theology, business and the graduate school. Those were, of course, the words of Rev. Dr. Martin Luther King Jr., the father of Rev. Dr. Bernice A. King 90L 90T, who earned one of the joint degrees the president highlighted. Taking the stage to help honor former U.S. Sen. Sam Nunn 61L 62L with a Lifetime Achievement Award, Clyde Tuggle, senior vice president and chief public affairs and communications officer for The Coca-Cola Company, explained to the crowd, “Emory students come into the university with a Coke in their hands and leave with one as well.” In addition to the Coke toasts that welcome new students and honor graduates, the tradition marks milestones across the university. Tuggle thanked President Clinton for making the trek from the “empire state of the North to the empire state of the South” and then turned his attention to Nunn, who spent 24 years representing Georgia in the U.S. Senate. During that time, he served as chair of the powerful Armed Services Committee and chair of the Permanent Subcommittee on Investigations. His legislative accomplishments include the Department of Defense Reorganization Act and the Nunn-Lugar Cooperative Threat Reduction Program, which provided assistance to Russia and the former Soviet republics to secure and destroy their excess nuclear, biological and chemical weapons. “In 1997, he retired from public office but not at all from public service,” Tuggle said, and that is borne out by the fact that Nunn currently serves as co-chair and CEO of the Nuclear Threat Initiative, an organization working to reduce the threats from nuclear, biological and chemical weapons. He is also a distinguished professor in the Sam Nunn School of International Affairs at Georgia Tech. The full list, along with short biographies of the winners, is available here. black editor-in-chief of the Emory Law Journal, the law school’s oldest publication. Myers presented the Emory Law 100 medal to Cooper, who after being one of Emory's first African American graduates, went on to become the first African American assistant district attorney hired to a state prosecutor's office in Georgia and then senior judge on the U.S. District Court for the Northern District of Georgia. Susan Clark, the law school's associate dean of marketing and communications, and Ethan Rosenzweig 02L, dean of admission, financial aid and student life, read the names of the other Emory Law 100 honorees who were in the audience. As they did so, student ambassadors were at tables to honor the winners with medals. Martin Worthy 41C 47L, celebrating his 70th year as an Emory Law alumnus, earned an affectionate response from the crowd as he received his. As Chilton Varner 76L, an Emory University emerita trustee and Emory Law distinguished alumna, introduced Sam Nunn, she emphasized that “he has been a leader his entire life.” Varner had the audience chuckling as she revealed that Nunn’s transfer to Emory after three years at Georgia Tech saved him from a “lifetime of trying to master mechanical drawing” as part of his engineering program. As lighthearted as he was in regard to himself, Nunn was serious about promoting civility as a remedy for what is wrong in the current political climate. Praising our system of government and its checks and balances, Nunn said that it compels us to work together to overcome differences. After Nunn's remarks, Atlanta Mayor Kasim Reed dropped by to offer “hearty congratulations to the school” and to Sterk and Schapiro for their leadership. Reed, drawing laughs, called himself “the sorbet between two extraordinary courses,” nestled as he was between Nunn’s appearance and Clinton’s. It has been 22 years since Clinton’s last visit to Emory for an economic conference that the White House staged at Cannon Chapel. He began by talking about the Emory Law graduates he had advanced during his administration, including five judges and two ambassadors. He also described a high point of his White House years being a meeting of Nelson Mandela with American church leaders, including Bernice King. Clinton recalled that he was still governor of Arkansas when he met Nunn and took over leadership of the Democratic Leadership Council from him. The two men didn’t always agree. Clinton noted a trip that he sent Nunn, former President Jimmy Carter and former chair of the Joint Chiefs of Staff Colin Powell on in 1994 to ease out Haitian military dictator Raoul Cédras. None of the three men was particularly excited about the assignment, especially Nunn. “I told them to go down there and let it be known that they disagreed with me,” Clinton said. “Because when you have rule of law and a free society, you can have disagreements.” As a result of the group’s negotiation skill, the transfer of power there happened peacefully. When Clinton spoke of the achievement of the Nunn-Lugar Act, he reminded the audience that American taxpayer money went to secure the nuclear assets of the former Soviet Union. In his words and those of Nunn, it surely did not. Even better, Clinton clearly saw a remedy in what Emory Law offers.